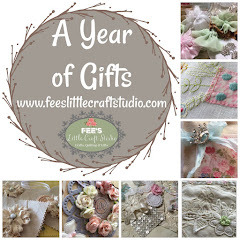 Fee's Little Craft Studio: Are You Ready To Start Living Frugally? "Waste Not Want Not" is what my dear Nan used to say. How true is that? Nan never wasted a thing. If you want to save some money in 2010 and also help to save the environment for future generations keep reading. We are known as the "throw away society" and future generations will call us the wasteful ones. A few small changes to the way you do things and a little effort will save you money and also help stop landfill and waste. Is there any area in your spending habits that could be cut? Could you save just $10 per week by not purchasing something that you really don't need or could do cheaper if you did it yourself. 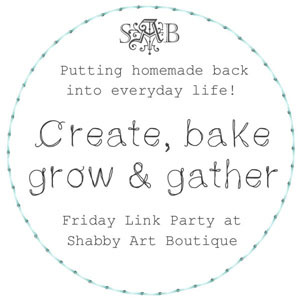 Would forward menu planning enable you to have Friday night off from cooking and instead of buying take away could you pop something into the oven from the freezer? How much would that save $20 ? $ 30? What would you do with that money? Let's say that you have a $200,000 mortgage (this can be worked out on credit card balances or personal loans) Over the life of the loan the interest rate would average out to be let's say 8%..... over 25 years which is about average for a mortgage these days. If you paid the $10 you saved for the week from your mortgage it would save $63.63 off your loan in accrued interest. Don't believe me? Go HERE . Enter the loan amount (whatever you like) Enter the average interest rate over the life of the loan. Enter the additional payment in the lump sum amount box ($10) and then enter "0" at Lump Sum Payment made After....... See what I mean? Now enter the $20 that you saved from that take away meal. Keep playing with it - It will open up your eyes to a whole new world of finance. Imagine being debt free so much quicker? What if you saved just $1 per day - That's $365 per year - That would save you $2307.65 off your interest. Not a bad return is it? 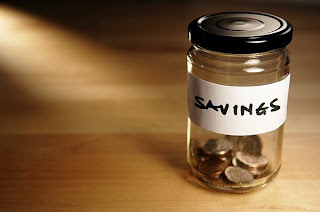 There are so many ways to save those $$ each week some require little or no effort but of course some will need a little - It just depends on how serious you are to save $$ - Join me in this year of frugal living and we will be one step closer to debt free living. And now to begin. 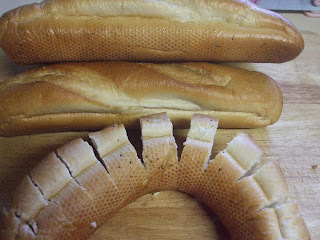 How many of use throw away our stale bread or crusts? I do have hens - But they are not great fans of processed bread and too much is not really good for them unless it is multi grain. 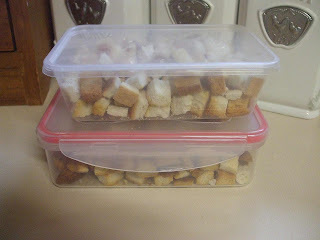 Clean out your bread cupboard and chop up all of the stale bits and crusts into little cubes. Lay them onto a baking paper lined tray and spread them out. Spray lightly with a little bit of olive oil spray. Put into a hot oven after you have finished cooking the evening meal and turn the oven off. 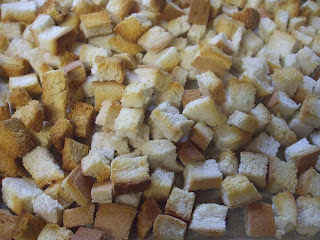 Eat Dinner & Wash Up and then remove the croutons from the oven. You will have nice crisp croutons. Allow to cool and place in air tight containers. Cost = $0. You were going to throw them out anyway. Energy Cost = $0 - Oven was off and the remaining heat would have been wasted. Savings = 150g box of Croutons from Coles is $3.98. An average slice of bread weighs 30g so just 5 crusts and you have saved $3.98. 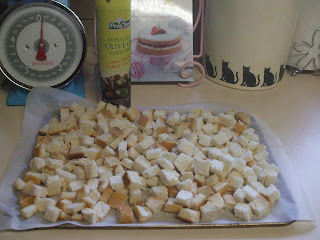 Croutons are fantastic in Caesar salads and Soups. I spend a little time every week going through the local supermarket catalogues on-line. I write down a list of items that I use regularly that are on special and buy enough for at least 3 months. I plan to do a menu plan on a fortnightly basis and will try to use my pantry foods as much as possible and this would include those items that I have stocked up on. You can save lot's of $$ by buying like this. I also buy items that I would not normally buy if I think that we will use them and if they are on special. Like these mini french sticks. 2 sticks in a bag last week for 99c. 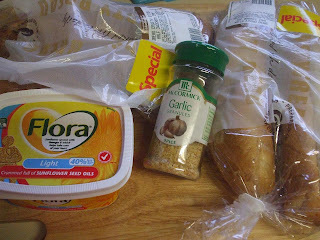 I bought 2 packs to make into garlic bread. Cut each stick into slices cutting 3/4 of the way down but leaving enough so that the stick stays together. Allow around 2 level tablespoons of butter or margarine per stick and sprinkle garlic flakes over it (Or fresh garlic if you prefer). 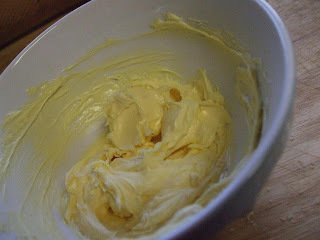 Around 1/2 teaspoon per tablespoon is enough. 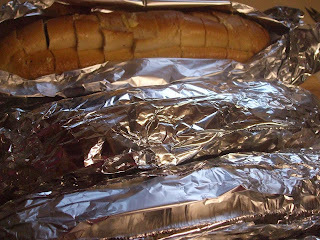 Spread between slices and then wrap in foil. Freeze until required. When you are ready to eat your garlic bread open up the foil to expose the top of the stick and bake in a moderate oven until the butter has melted and the top is crispy. I estimate that each loaf has cost 99c to create. The cost for a Coles brand stick is $3.65. That a $2.66 saving per loaf - A total saving of $10.64. It takes about 15 - 20 minutes to prepare 4 loaves. And to show you a little sewing - I created this little bag yesterday. The doctor has put me on some medication in a big box and I didn't want to carry it around in my hand bag in it's box so created this lovely little draw string bag to keep it in. It is made from a little stitchery designed by my friend Vicki and a fat 1/8th of fabric Plus the lining and a little ribbon. I now have something pretty to carry it around in for hardly any cost at all. 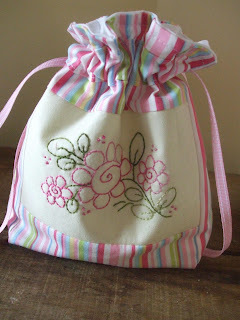 The tip here is that little stitcheries and scraps of fabric can be made into beautiful items with very little effort. Thanks for the tips Fiona. With only one wage for the past 3 years, we've been living quite frugally - Talk to me about feeding a family of 4, 2 dogs, 1 cat on a grocery shopping budget of $120 a fortnight!!! Generic brands are a godsend! Of course there is my stitching to keep me sane! I'm with you this year!!! 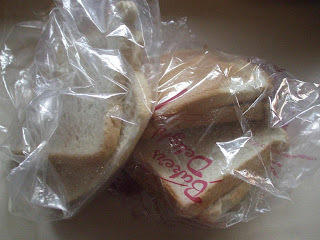 Frugal living is the way to go....we use stale bread and grind it into breadcrumbs which we keep in sealer bags in the freezer! 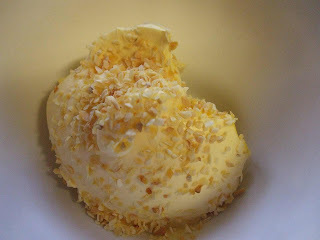 Useable straight from the freezer and knowing that it cost nothing makes it taste even better!!! sugary sweet hugs for a wonderfully sweet new year! Thanks for the tips! I'm anxious to see what kind of tricks you have up your sleeve. Thanks for the tips - it is always easier to get back on track when someone else reminds us. May 2010 be a good year for you and your family. Fabulous tips already!!! Thanks Fiona .... oh, and I love your little bag, how cute :o). Thanks very much for a very interesting post. I am going to try and live frugal this year and sort out my finances. That is my goal for 2010. 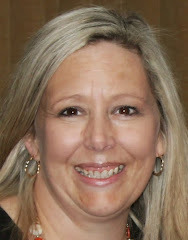 I am looking forward to follow your blog this year. One way of saving that everytime I shop with my debit card 10 kronor is put away on a different account. 10 kr is not very much, but it does amount up quickly and effortlessly. I love your tips . I do have money tins we have one for the grand children were we put all coins in and another were we put 50,1.00, 2.oo, 5.00 in it. Thanks for the tips, I'm eagerly awaiting your next installment. I shall be following your tips and hope to save enough to go on a quilting trip. I make our own bread and small bread rolls then freeze them, nothing ever goes stale. For school lunches they are cut and "filled" while still frozen, but are lovely, fresh and soft by lunch time, when they've defrosted. I have two bread makers I got second hand around $30 each!! Every few days I have bread dough going at the same time in both bread-makers, when ready get the dough out and make my bread rolls which is 16 from each batch. Then after their required raising time, into the oven. Not long after 32 lovely fresh rolls!!! A couple of days ago I made up 10 jars of my own spaghetti bolognese sauce from 5.5kg of fresh ripe tomatoes from my parents garden, which was too much for them. I bottled the sauce into recycled "Chicken Tonight" size jars, collected from family and friends. This batch made up 10 jars about $25 worth if bought in a shop, maybe more. I haven't priced one of these jars for a long time. I've been making this sauce for a few years and have a continual supply on my self. I have my own Vacola bottling outfit and at the beginning of 2009 did my first batch of diced tomatoes. Again a great saving, especially when given someone's "over produce". If you want me to share any of these recipes, please email me. I look forward to what you share with us this year. My household is definately joining yours this year. The menu for the week will be planned again, my hubby will be the one calling into the supermarket on the way home - he doesn't buy anything that isn't on the list!!! I visited Costco in Melb in Nov and bulk bought washing powder and other cleaning products, has saved me a fortune! Thanks Fiona. Great savings ideas, especially with the once again rising interest rates. My daughter loves garlic bread so I have just added long bread rolls to our shopping list. I will also continue to ensure that I stock up on high use items when on sale. I now have a master shopping list for these items in my shopping list book so I always know which items are getting low. Thank you Fiona - I am all for frugal living. I'm ashamed at how wasteful our society is and have already made a start to save some cash this year - more time and effort will be needed but the rewards are worth it. I already made homemade soup, bread and muffins today with items left in cupboards and fridge that may previously have been thrown away. I'll be looking out for you blog postings!! I am right there with you on this. I am really going to try hard this year to be more self sufficient. I want to start making my own bread products, make all gifts, and start gardening more this year. Also playing around with the idea of goats and chickens. Of course we only have one acre in the country. Thanks Fiona, great way for us all to keep 'on track'. Here's to a fantastic year. we can all live more frugally :) ...though i must say i feel less guilty having dogs to eat left-overs LOL, but still doesn't really account for the waste. Love that little bag! So cute! I've been living frugally for years and love your fresh prospective. I will sign on as a follower in a minute! it cost nothing makes it taste even better!! !